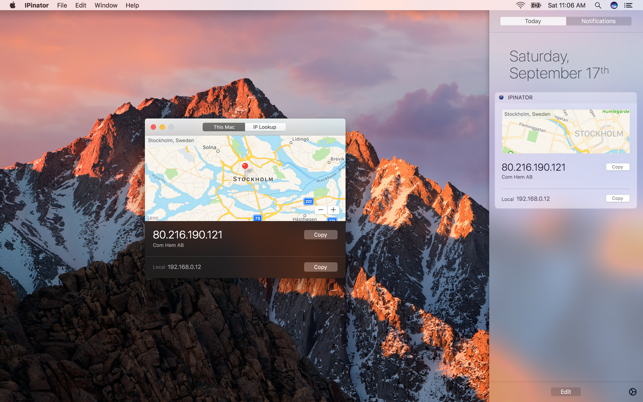 Elegant IP address lookup and geocoding for macOS. – Get instant information about your local and external IP addresses, complete with ISP location data and the ability to quickly copy the addresses. – Look up any IP address to find out about its location and other public metadata. – Use the Today widget for quick access to your addresses. – Supports both IPv4 and IPv6 addresses. – All network communications are done via HTTPS. If you have any issues using the app, please contact support at ipinator@kaishin.co. Fix bug with Today extension in Dark Mode. I live in Beijing and run a VPN to connect to the outside world. When my ISP detects I’m on a VPN it will usually drop the connection. I use this app to determine make sure I’m still correctly connected to my vpn. Although they don’t list it as a feature, it will ping when your IP address changes. Also a quick click of a hotkey will refresh your location making sure you are always up to date. I’m not sure what other people would use this app for, but for this use it is the best utility I’ve found for the job. © 2018 Reda Lemeden. All Rights Reserved.